A human being is incarnated into a physical body, and thus is shut off from the larger Reality: the Realm of the Soul and Oneness with the All. Yet, while living in this confined consciousness, a human being can achieve Self-Realisation or Liberation in this lifetime, by aligning the various personality bodies with each other, so that the Radiance of the Soul can be experienced. 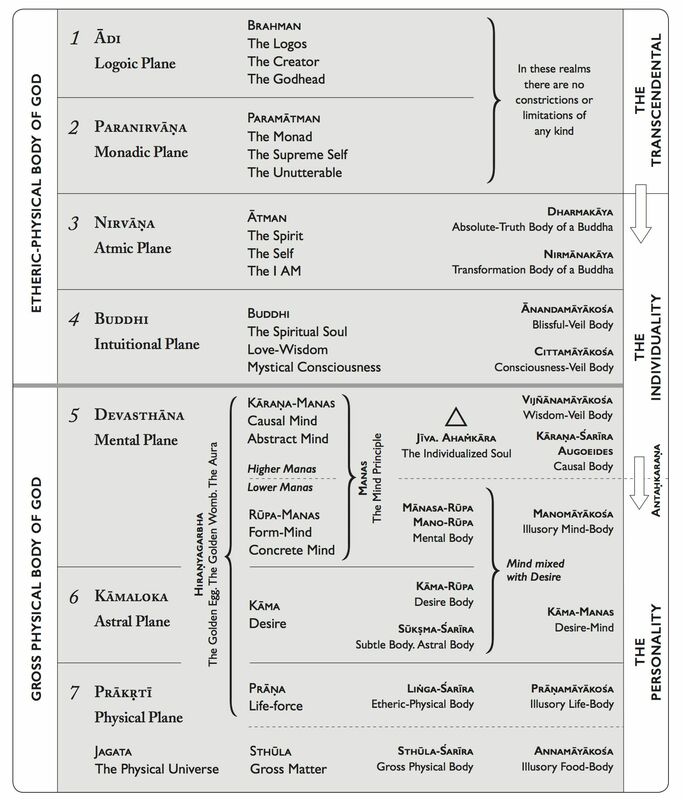 The attached diagram of The Human Constitution shows how much larger consciousness can be and how limited the personality structure is compared to the Larger Being of every Human Soul. The Path of Devotion (Bhakti Yoga) – Related to emotions, religious feelings, devotion, inspiration, chanting and religious rituals. The Path of Action or Service (Karma Yoga) – Involves physical actions in the Physical World. The Path of Mental Effort and Knowledge (Jnana Yoga) – Related to the mind. It involves mental development, the understanding of truth, science, philosophy and metaphysics, the developing view of our Universe and the awakening of Creative Intelligence. The Path of Meditation (Raja Yoga) – Related to the art and science of meditation, the levels of consciousness and the various states of inner attainment. – vertically for our inner Realisation, Enlightenment and Liberation. – horizontally, to develop the personality harmoniously, and to direct the inner spiritual life in our modern, daily life of work and family. Then we can contribute constructively and positively to the world, wherever we are, and help bring our planet into the New Age of Light. Thus, there is a balanced spiritual development, with both inner and personality growth, for the transformation of our planet into a bright future for all mankind.